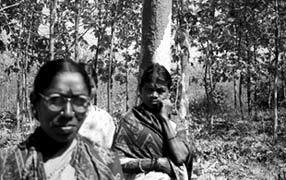 the Andhra Pradesh government's move to legalise forest users' groups called Van Samrakshana Samitis (vss), created under its joint forest management (jfm) programme, has sparked off a controversy. The government recently drafted a legislation called the Joint Forest Management and vss Rules, 2000, as an addition to its Andhra Pradesh Forest Act of 1967. Though there has been a demand from environmentalists and ngos to legalise jfm institutions to ensure community rights over natural resources, the bill is being opposed on the grounds that it will strengthen the forest department's control over these institutions, instead of giving them more power to manage the forest resources regenerated by them. "It is a forest department oriented bill rather than a jfm-oriented one," says K S Gopal, a former convenor of the apjfm secretariat, a confederation of ngos working for the jfm programme. However, the government claims that the draft bill is the logical end of its successful jfm programme. "It will bridge the gap between the vss and the forest department," says K Subba Rao, the principal chief conservator of forest, Andhra Pradesh. Many vss and ngos have now started mounting pressure on the government to modify the draft bill. In fact, they are drafting an alternative bill that gives sweeping rights over the natural resources to the communities. "The bill is without the spirit of participatory forest management as envisioned under jfm ," says Gopal. The programme, implemented through 7,000 vss, is regenerating an estimated 1.6 million hectares of degraded lands. In many areas the water table has gone up within three years of the programme and has led to a rise in the income of villages by 50-60 per cent, according to government estimates. Between 1996 and 2000, the World Bank funded the jfm programme. A fund crunch prompted the state government to invite industrial houses like the Reliance to take up commercial forestry through a secret government order in September last year. This triggered widespread protests and the government had to finally give in to the protests. During this period, the vsss started a signature campaign against the move and also sought legal status. The current controversy comes at a time when the World Bank has assured Rs 350 crore for the next phase of the programme. "The World Bank wants it to be a community forestry project (where the community will be managing the forest), but the government wants it in its own bureaucratic way," says Ravi Pragada, director of Hyderabad-based Samatha. The bill was to be placed in the assembly's budget session, but the controversy forced the government to delay it. According to sources in the forest department, the government wanted to rush with the bill in the assembly because of the World Bank's condition to make these institutions legal before sanctioning Rs 350 crore for the programme. Says a high-level forest official, "It is true that the bill has to be passed before the World Bank releases the money." The bill seeks to increase the powers of the district forest officer (dfo) who can remove any member from the vss even though the bill remains silent on the nominated members from the forest department. Similarly, in the event of a conflict between the vss and the dfo , "the dfo's decision shall be final." This will paralyse the functioning of the vsss. Despite the bitter experience, the bill privileges the government over forest produce. Forest produce is the crucial incentive to the vss members to take up regeneration activities. This is where the government is facing the strongest opposition. The bill says that surplus forest produce must be sold to a government agency only. But it is this revenue generated through the surplus that makes it self-sustaining. As around 30 per cent of the vss are in the Fifth Scheduled Area, there is a fresh debate on the rights over the minor forest produce. According to the constitutional provisions and the Panchayati Raj Act, minor forest produce is under the control of the village council, the Panchayats .